Large room on the third floor with a surface area of over 30m2. The room has a wooden floor, a double bed (1.80mx2m), a sitting area and spacious bathroom with a shower and toilet. 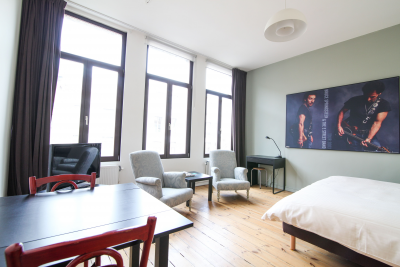 The room can be occupied by maximum four people by adding two single beds. 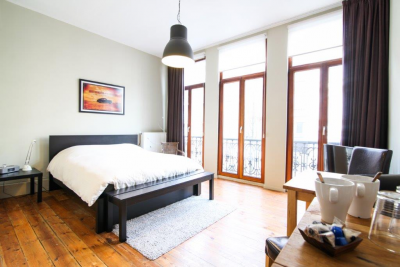 Spacious room (30m2) on the second floor with good lighting and view of the Zuid. The room has a wooden floor, twin beds (1.80mx2m), a sitting area, fully equipped kitchen and bathroom with a washbasin, toilet and shower. Room can be occupied by maximum three people. Elegant room on the first floor with a surface area of 25m2. 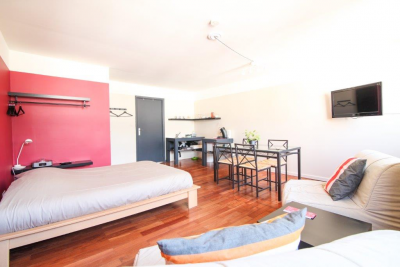 The room has a wooden floor and high windows which allow a lot of light to enter the room, a double bed (1.60mx2m), a refrigerator, a microwave and kitchen tools. The bathroom has a washbasin, toilet and shower. The room can be occupied by maximum two people.